Black on Black Licorice with metallic gold. We recently discovered we can run 100# French Paper cover stock through our photo plotter and have been checking out what it can do. I put together this set of Pantones in Illustrator and the result is not too shabby... the ink doesn't pop like a screenprinted poster but I didn't have to burn 1,081 screens either. Small run of 100 on French Paper 140# Speckletone Madero Beach, all proceeds to charity. I'm not sure where these are available but will update the post when I know. We've had our busiest summer to date and even threw in an earthquake and hurricane for good measure. Here's to whatever's next.. But she did want these bags made with her kid's shoes hanging from them, just like they would from any respectable Brooklyn power line. The pictures of her kid's shoes weren't hanging just right but we had Chris's busted Adidas which worked out. Apologies for the lack of updates lately but we have been super super busy and are actively looking to expand our capabilities, equipment, and hire more staff. 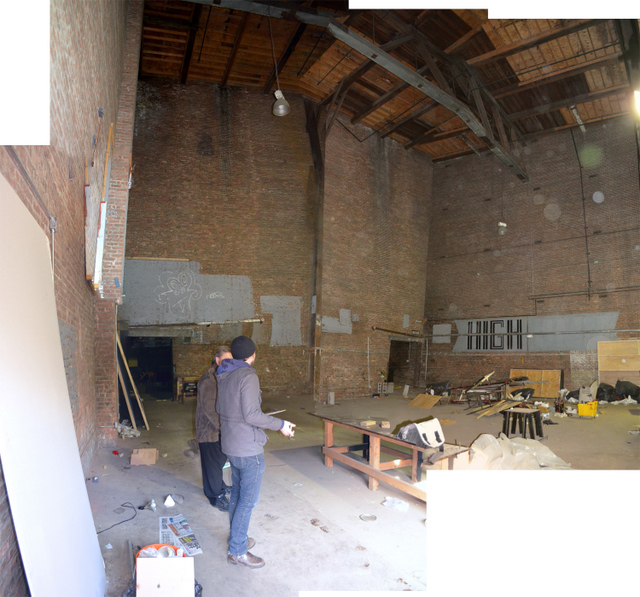 This place looked promising and with its 46' ceilings we could print extremely large T-shirts. Some nice details in this one. Click for larger images.